I hear they are installing electronic sensors on poles at both ends for automatic tolling, in compliance with the new boaters canal fare law they passed recently. Seems pretty steep to me. Once they get the electronic sensors on the poles they should be able to identify all those who fish inside the canal in boats against the regulation now. Just think of what that may do to the night traffic for those when they sneak inside to catch those fish running along the breakwaters now after the current changes . if your fishing along the rip rap you will not need to be yelling out to those who with lights off pull up in front of you hoping to put some fish in the box to sell. Electronic sensors will light the place up and watch how fast they sail away before they get a picture taken and an nice fine for sure. 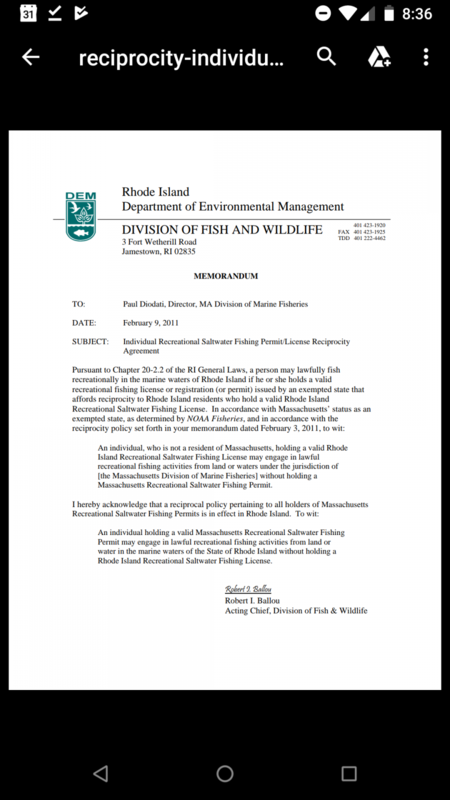 I believe the only reciprocity issue in MA is that if you are a MA resident, you must have a MA license to fish in MA waters. This is likely true, but I have it straight from both the relative MA and RI agencies that non residents (say folks from NJ) cannot get a Mass license and use it in RI, or get a RI license and use it in MA. Each state's memorandum concerning reciprocity is written very differently. Whether intended or not, the language is pretty clear. In a hypothetical world, if RIDEM were to ask for your licence and you presented a valid MA license, and you were fined, you'd be crazy to pay. Yet another ACOE ill-conceived idea. After numerous incidents with seagulls making the currently installed canal camera's inoperative, they come up with this idea. Seems they will never learn. You are 100% correct Joe, a wall would be more effective, user friendly and cost less...……………. PS The cameras on the MMA building still work...…………..
And that's only because they play the pre-recorded sound of a cannon blast when the birds congregate around the camera lens. That sound sends the birds flying away for a few hours. The rest of the canal camera's have no such sound deterrent in place. It's only through the expertise of those ship captains navigating thru the canal, and not the canal camera's, that we've not had a major marine accident in the canal. Joe those camars over the years helped a few sting opporations when it came to night time poaching of Lobsters and at least one drug and shell fish poaching sting that I am aware of off. I can recall once sitting in the control area under the railroad bridge , watching the different screens cycling and actually seeing the night time activity that resulted in several arrests . They do have a purpose other then seeing who is coming through the canal in boats and how fast they may be traveling. Joe those camars over the years helped a few sting opporations when it came to night time poaching of Lobsters ….actually seeing the night time activity that resulted in several arrests …..
Sure, nights are certainly different. I've not heard of the ACOE having a problem with gulls during the hours of darkness. photos or videos of those who don't pick up after their dogs ? Canal etiquette is no joke! Quack - all of that is not in question. What IS in question is whether someone that is not a resident of Massachusetts OR Rhode Island gets a license from one of those states. I was told directly by the officials in both states that it would not be honored under the agreement because they are not a resident of either state. This came up a few years ago when some friends from NJ were up at the usual fall place in RI. That year there was an outside chance I would take them to the canal, so I had to look into the law, and that is what I was told. Interesting in a winter non-fishing, time killing kind of way.. I always took the interpretation to mean (and I still do), that in RI all you have to do is have a license from a state that honors reciprocity. 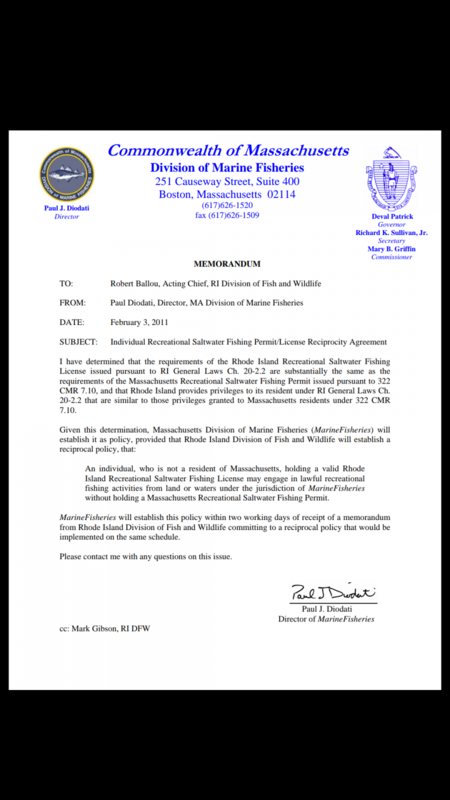 (3) A federal saltwater angler registration issued by the national marine fisheries service. FWIW, Personally if I was told something by an " official" that differs from what is written as law I would go with the written law. I give you that the law is kinda vague as written, and why I called to get some clarity. To be realistic the chances of any of it falling into place such that it would be an issue are slim. Surprised that RI will accept the NOAA registry in lieu of a state license....it is one of the few states that does.